In Greek, the term "Sarcode" means fleshy. Sarcodes imply protoplasm of animals as distinguished from vegetable protoplasm. They are obtained from healthy endocrine or ductless glands or normal secretions of living human organs and lower animals. The secretions are mostly hormones. 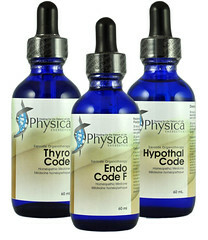 Sarcodes are used for the homeopathic support and correction of the indicated substance by providing the correct resonating, oscillatory signature of a healthy, well functioning gland or secretion. A strategic blend of X and C potencies are present for this purpose as are accompanying “classical homeopathic” ingredients, minerals, polychrests and low potentized botancials for specific drainage and decongestion. All ingredients are hand crafted from mother tinctures, hand potentized per Hahnemann and hand succussed. Products are stored in protective cobalt blue bottles, and labelling and bottling are performed without electricity, keeping the products clear and pure. Note the inclusion of flower essences in several organotherapy products, appropriate to the targeted gland, organ or system.